Rosamond Richardson was the author of several books about the countryside, including the international best-seller Country Wisdom. She wrote regularly for Britain’s biggest-selling bird magazine BirdWatching, and for several years was a contributor to The Countryman. Familiar to many as author of the Penguin Classic Hedgerow Cookery and co-presenter of BBC 2’s Discovering Hedgerows, she also wrote for LandScape and CountrysideNFU magazines. 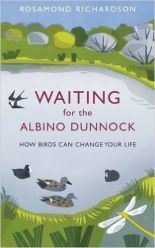 Her final book, Waiting for the Albino Dunnock, published in 2017.